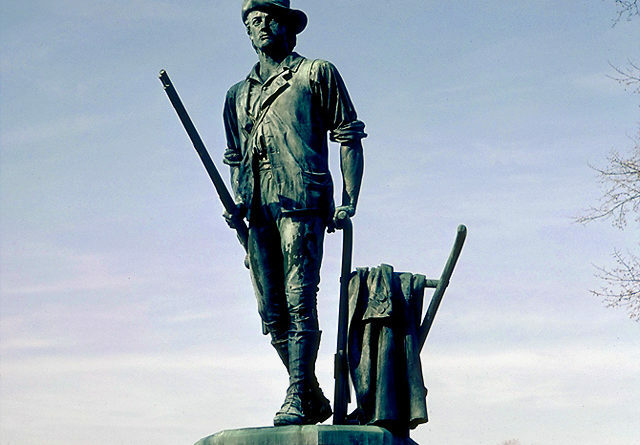 "The Minute Man" statue by Daniel Chester French in Concord, Mass., which depicts Isaac Davis, a gunsmith and militia officer who commanded a company of Minutemen from Acton, Mass., during the first battle of the American Revolutionary War. Listen, my children, and give a pause for the midnight ride of William Dawes. Alright, so Henry Wadsworth Longfellow knew he could get a better rhyme out of “hear” and “Revere,” but the result of his famous poem from “Tales of a Wayside Inn” is that Paul Revere’s fellow rider, William Dawes, is largely unknown to most Americans. So, how about three cheers for Dawes on this Patriots Day? Their momentous ride was set off by Robert Newman, the sexton of the Old North Church, who climbed the church steeple on the night of April 18, 1775, to hang two lanterns there. The lanterns signaled that the British had begun a march to Lexington in search of revolutionary leaders, particularly John Hancock and Samuel Adams. After the lanterns were hung, Revere and Dawes set off for Lexington to warn their fellow patriots. On the way to their next stop, Concord, they were detained by the British. Dawes was able to slip away, while Revere was later more famously released on foot. It may be that the former’s skills of stealth served him well on his journey but not so well in the history books. The British met little resistance on their way to Concord, though the 70 Minutemen who waited at Lexington on the morning of April 19 would prove to be able fighters later. The colonists at Lexington had the good sense to disperse after seeing the overwhelming number of redcoats — but not before one of their members, or perhaps a British soldier, fired the shot heard round the world, and the war was on. The site of the battle is now Minute Man National Historical Park, established in 1959. The park service bought and demolished many modern homes and businesses in the 1960s and restored the fields and orchards. The park’s 1,038 acres spread over Lincoln, Lexington and Concord. Just two states — Maine and Massachusetts — still mark this momentous event in American history. Massachusetts, understandably, celebrates the day more obviously than Maine: It has re-enactments and readings and runs its famous Boston Marathon. Maine marks it in quieter but no less patriotic fashion. And the rest of the states? Perhaps their schoolchildren also are on vacation this week, so the lack of observation of this important day in their histories is not so noticeable. Still, a more nationwide effort of reading Longfellow’s poem by those sporting tricorn hats wouldn’t hurt anybody. Except perhaps the forgotten Dawes.